There will be a vote by the Association Membership at the meeting whether to donate the Union Square Fountain to Franklin Square. Don't forget: This is the last GENERAL MEETING of the year. 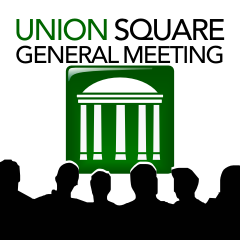 There will NOT be a GENERAL MEETING in January because that is the month for the ANNUAL MEETING with the sole agenda item of electing the 2012 Board for the Union Square Association (USA). More details about the Annual Meeting are coming soon.